It's been a busy week around the Out of Step Arts offices. I've been working on the website, applying for my LLC and Tax stuff, shopping for a new scanner and trying to sell some art from my personal collection to help pay for it all. But today, I received some truly great news: Alexis Ziritt will be signing on with Out of Step Arts! Now if you don't know Alexis or his work, I think you will soon. He was part of the creative team for the 2011 Harvey Award nominated POPGUN Vol. 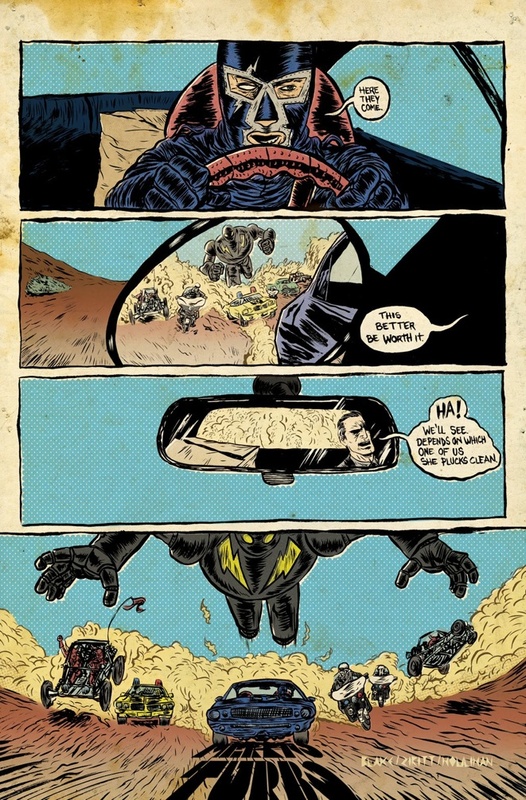 4 anthology from Image Comics with his work, along with Elliot Blake, on their MEKANO TURBO story. Alexis is also working with Elliot on a new project called "The Package". They are currently trying to raise the funds to make it happen via a kickstarter project. I hope you'll consider giving them your support. They are are so close and the drive is almost up! And the best part? Alexis has his own t-shirt design company called FISTFUL APPAREL. Alexis not only does his own designs, but he works with other artist like Paul Maybury and Eric Bonhomme as well as others to put out their designs. This is going to be a great potential opportunity for the artists who join the Out of Step Arts crew. Look for more information about Alexis and examples of his work on OutofStepArts.com in the next few days. If you are interested in having Alexis do some commission or illustration work, please get in touch with me and we'll work it out.